There are many different safety features that come standard on today’s forklifts. Features like steering wheel horn, rear grab bar horn, back up alarms, headlights, rear lights, signal lights, and strobe lights are all typical standard safety features, however there is a newer piece of technology that is proving to be a vital safety feature for many companies. What makes the blue safety light a great addition to your equipment? 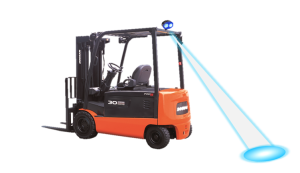 Many industrial companies operate within a loud environment and an alerting noise may not be enough to stop a pedestrian from a run in with a forklift. Download our Blue Light Safety brochure here!